Since arriving on the Island, I have encountered dozens of fascinating creatures whose behavior has never been studied or documented...and also sheep. Granted, Ovis arcam is quite different from the modern domesticated sheep - and even from wild sheep species such as Ovis orientalis. The unique markings on its face give it a striking appearance, and the males' horns possess a unique shape that is unlike any other species in the Ovis genus. As one might expect, Ovis stands little chance against this Island's many predators. Like the Dodo, its continued survival in the face of these challenges is a mystery. Some survivors have found herds of Ovis to be useful in farm life. Their wool can be repeatedly safely shorn with the proper tools, and cooked lamb chops are a popular dish among some tribes, as is their hyper-nutritious mutton. Every now and then, a survivor with a sense of humor will attempt to utilize Ovis as a mount, although the joke becomes significantly less funny once their slow Ovis is run-down by a pack of Raptors. One tribe has grown particularly attached to Ovis, perhaps uncomfortably so. I don't know the tribe's actual name, but I refer to them as "Sheep Lovers." One of the many peaceful creatures on the Ark, Ovis will not attempt to attack in any way, much preferring to flee to safety. The Ovis otherwise ignore other creatures and players entirely. When attacking on foot, be cautious of placement. Ovis will clamber up steep rocks with ease and leave you without easy access. The Ovis looks much like a modern-day domestic sheep, though slightly larger. The most prominent feature of Ovis is the horns of the males, which are highly ornate. There are six horns; two pointing straight, two spiralling like some breeds of rams and two small horns on the cheeks. All the horns have grooves in them. This section displays the Ovis's natural colors and regions. For demonstration, the regions below are colored red over an albino Ovis. The colored squares shown underneath each region's description are the colors that the Ovis will randomly spawn with to provide an overall range of its natural color scheme. Hover your cursor over a color to display its name and ID. For example, "cheat SetTargetDinoColor 0 6" would color the Ovis's "body" magenta. Using the (PC), (PS4), (Xbox One), the Ovis headbutts the target. The target's Torpor will increase by an amount equal to the damage dealt over 5 seconds. This effects stacks with each hit from a wild Ovis, however attacks from a tamed Ovis stack up to two times for a maximum of 10 seconds torpor debuff. This section describes how to fight an Ovis. Although they are a trivial kill, they can drop a large amount of mutton that is quite heavy, so it's usually best to pick them up with Argentavis and fly them home before killing them. 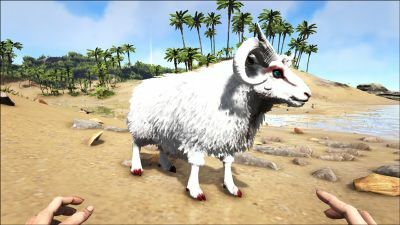 Most players prefer to tame them, see below for more information. Ovis can easily be killed with tamed dinos, or players. The Ovis is most commonly found in areas with dangerous predators and/or extreme cold temperatures. The Ovis itself poses no threat. In addition to its low health, it has low stamina, which means a tamed Ovis can't run away for long before running out of stamina. , 2 × Savoroot , 4 × Stimulant , 25 × Fiber , 1 × Water Note that the values are for optimal cases, always bring extra supplies! Although the Ovis is passive tamed with Sweet Vegetable Cake, they are able to be fed with berries to top up their food both from their inventory or a feeding trough once tamed. The Ovis drops Raw Mutton when slaughtered; a very efficient taming food for carnivores. Raw Mutton tames most carnivorous creatures approximately 1.5x faster than their preferred kibble in exchange for a slight decrease in taming effectiveness. It can also be cooked to make Cooked Lamb Chop; an extremely beneficial food. The amount of Raw Mutton increases with the Health stat. If a gestating ewe is on the ground when giving birth, the baby is often forced under the ground, making it impossible to reach. If she is on a ceiling, the baby often, but not always, falls through the ceiling. The best solution is to put the ewe facing uphill on a ramp, which tosses the baby into the air behind the ewe, and allows it to fall naturally onto the surface of whatever is under it. The Ovis does not collect any resources by itself. However it can be sheared for Wool using Scissors which can allow survivors without access to Pelt to create Fur Armor and explore the snowy areas of the map, and killed for Raw Mutton, for food for taming and feeding carnivores, and cooking for feeding players. Dino Dossier revealed on 12/26/2016. The sheep dossier was revealed in conjunction with the steam award for "best use of a farm animal". 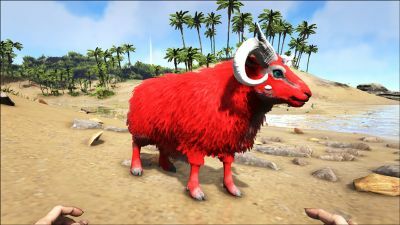 The developers stated that the sheep was going to be released with the next patch if ARK won the award. 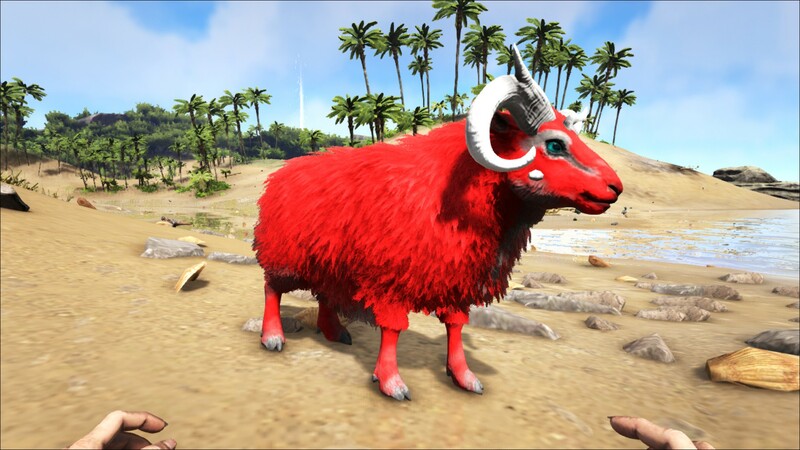 However, if ARK did not win, the sheep was going to be released regardless, just at a later date. The original post mentioning the ovis caused some backlash in the community, and the developers reworded it and tried to clarify their intentions. Interestingly, the dossier for Ovis features two different taxonomic names - one being Ovis Aries (the officially acknowledged name), and the other being Ovis Arcam (which translates to Sheep of the Ark). Perhaps this indicates another similar animal yet to be announced, or is a nod toward the sexual dimorphism displayed in the contrast between the ewe (female) and ram (male) in the dossier. Then again, similar errors have been made in dossiers before (such as the Dodo dossier). It is a good idea to tame the ovis whenever you see one in the wild, as they are very rare, and you can kill them later if you are in need of raw mutton. Ovis do a tiny amount of torpor damage to creatures they hit while you ride them. Due to hitbox glitchyness, the Ovis attacks in a small AOE behind them even though their attack animation is a forward headbutt. This torpor attack is almost useless for any creature with more torpor or hostility than a Dodo due to the extremely low health of Ovis. A lucky born of a mutated Ovis.